B2B organizations and marketing agencies. 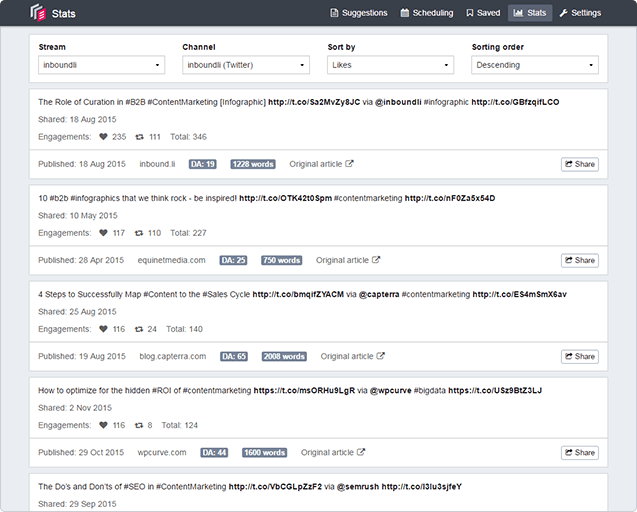 inboundli uses AI to automate content curation and distribution on social media. 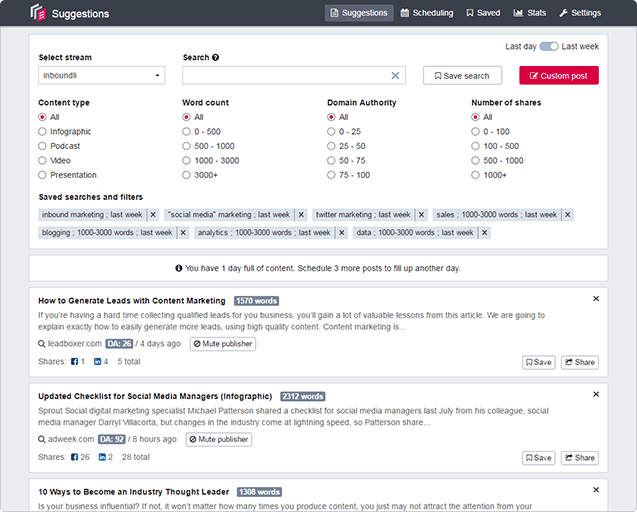 Use inboundli to save 98% of time on social publishing and multiply your content output. Large companies have the budget for reputation management tools that come with digital media news monitoring but the price tag is in the tens of thousands of dollars per year. Having used these dashboards I really wanted the same efficiency and effectiveness for the small to medium businesses. Using inbound.li reduced my social media time from over an hour to under 10 minutes a day, and the articles it finds are better, more varied, and hyper-current. When taking on a client, if social media is involved, I wouldn't proceed without the budget to have Inbound.li in my toolkit. Kudos to Gene and the team at Inbound.li, you make it easy for marketers to look great and produce results. Pros: - The relevance of content is really good, at least in our case (we're focused on a unique industry). You just need to provide some influencer blogs and media in your industry, some competitors, and you will see relevant curated content flowing in quite quickly. Overall: We wanted to reach and engage more construction stakeholders on social media and position ourselves as an authority in the industry. Within just the first 3 months of using inboundli, we had a 132% increase in link clicks, 101% increase in other engagements (e.g. likes, retweets, comments and replies), 111% increase in new targeted followers and 215% increase in visits from social media. Pros: I love everything! But if I had to pick one, it's the enormous amount of time saved (est. 98%) from having to curate, repurpose, promote, schedule, optimize and manage our's and all of our client's social media accounts. Overall: I cut 98% of my time and labor towards social media publishing, curation, blog promotion, content creation, optimization, scheduling and increasing brand awareness, just by using Inboundli. Yes, the software is truly that incredible and powerful. Pros: Simple straightforward functionality that works as advertised. Cons: I wish the text editor in the blog was more robust. Overall: I have had a wonderful experience with Inboundli. The software is easy to use. It has powerful functionality that quickly and easily will allow me to take care of my company's social media & content marketing needs. The chrome extension feature makes it easy for me to pull in content as I find it and re-post it. Inboundli's software has made this process easy and effective. But the strength of the company is the personal support and direction I have received. Being new to content marketing Gene and his time have spent hours with me teaching best practices and training me how to improve my marketing for maximum effectiveness. I highly recommend Inboundli to anyone from the beginner to experienced marketer. Pros: I like that inboundli is intuitive and has a clear design. I think they have the best and fastest support I ever got. Cons: I'm using inboundli for almost a year and still discovering useful workflows. It could use more tutorials or documentation so that potential use cases are clearer to people without a marketing background. Overall: In just a few minutes every day, inboundli helps me to share the best design-related content and engage my target audience. Within the very first month I saw my interactions on social media triple. 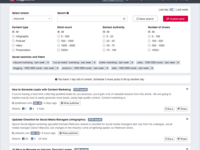 Recommendations to other buyers: If you need a quick workflow to get a lot of high-quality content on your social media or blog, inboundli is simply the best option. It's one of the few tools that I use every day. Pros: It is easy to use and helps marketers find content quickly. Overall: We have been using Inbound.li for more than a year. The ability of the tool to find high quality content even for niche markets is phenomenal. Their algorithms, once trained, find the best content. 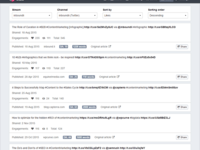 Additionally, the tool enables users to capture a set of articles to be shared later in a blog. These sharable blogs expand the value of the content curation function. Comments: We were happy with inboundli. We are not publishing and have terminated service. We would subscribe again if we come back. Pros: Strong support - very useful scheduling tool for social media origination. Interesting search function - we would want to exploit that more. Cons: nothing really - lots of tips, reliable service, sound advice. A reasonable expense for a tight budget. Pros: Inboundli is great for social media managers. The ability to curate specific content and post to social channels all in one platform makes managing social channels easy. Cons: Pretty solid platform, just makes sure you set up your streams properly so that you only curate content that is relevant. Pros: Easy to use, targeted, and time saving. Used the service for two years and liked it's simplicity and ease of use. Cons: Not the product's fault- just not a good fit for our business. Our particular business/customer does not do enough in social media. Pros: We've used inboundli for about year and I couldn't be happier. With inboundli we're consistently delivering content to our followers that's of interest, current and of good quality. We've also been able to reduce the amount of time it takes to manage our social media presence and increase our follower count and interactions significantly. Cons: The user interface is a bit 'engineer-ish' but functional, easy to understand and intuititive. Recommendations to other buyers: It's a small investment to really grow your social media presence and build an engaged follower base. Comments: I have been using inboundli software since their early days and I am still a very happy user. 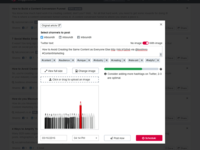 In time they have implemented many more features, but the fact that they are somehow able to find the right content for our customers amazes me every time. Especially as I am not speaking of the usual suspects like forbes or huffingtonpost but also articles from small magazines I never heard of before. Somehow it seems they are able to scrape the whole internet. It is very easy to use, just select the article you want and share it. I really like the option of suggested hashtags and the fact I can use a predefined schedule list makes our live much easier. Is there anything negative to say ? Actually not much. When we started our social media strategy we tried several tools like buzzsumo, feedly and topsy. They offered more and/or different options. In the end inboundli is only one we still use every day. Time saver and fan gainer! Comments: This software is a huge time saver. You can keep your Social Media accounts topped up with highly relevant content that people will love. Sharing great links get's you noticed and gets you followed. It's as simple as that. The Inboundli software nudges you when you've run out of updates, it learns your interests and finds great stuff for you to share. But when it gets it wrong you can choose to ignore the publisher so refining the selection further. The team are continually improving the software, adding features and are always approachable . I can't fault them. The interface is easy to use and it's difficult to find fault anywhere. The only thing I'd change is the ability to save a link AND also publish it. Currently you can only do one or the other. I bet they make that change if they read this! Pros: Experience: Overall, it's an amazing product. Our marketing team literally saves a bunch of hours because of inbound.li We used to go manually and share posts, now it's all automatic. Its super simple to use and user friendly. We just love it. Cons: We would've liked to see more functionality and better statistics. Recommendations to other buyers: I would recommend testing how easy to use a software is and what value for money it gives the marketing team. Loved ibnoundli from the very start! Comments: It's one of the tools I use the most - It helps us get the best content to engage our audience on social media. I liked inboundli from the start and it only gets better as you use it and it learns from your behavior. I highly recommend it to marketing departments who want to be successful with third party content. Pros: Very easy to learn and use. Responsive support. Recommendations to other buyers: If you are interested in content curation, this is definitely the tool to use. Pros: For a business standpoint, I love the idea that a business has the ability to source content from resources that are skilled in the writing world. This eliminates the possibility of throwing an employee into a position they may not be comfortable in, just because the social media content is needed and there's no one to fill the role. Cons: I have not seen anything negative with this so far. Comments: I have been using this for my own website, www.sapbwconsulting.com for about 6 months now, and have had excellent results. I had evaluated various content curation solutions for the past 3 years and this one has proven to be amazing at finding just the right kind of content I want to share. The deep machine learning shows up each time I use it as it gets even better at finding content that fits my criteria. Best of all, it has reduced my workload as I am now generating more leads than ever with it as it seems to supercharge my own content. Pros: - The people who run inboundli are extremely helpful. They make themselves available whenever we need help and are very knowledgeable about content marketing. - This is the only product we could find that schedules recurring social media posts while also integrating with Hubspot. This was important for us for tracking and analytics. - The content recommendations are really spot on and comprehensive. Cons: - The blog feature is not exactly what we needed, as it's not very easy to customize the look and feel. Comments: When I first started using inboundli, I really thought my automation would make my online shares suffer. It's not an easy balance. But what they offer in feeds and the ease of use has given me more time to take care of other things, like connecting with people that appreciate the articles and blog posts. Ultimately, customer service is paramount in my industry and I can honestly say, the guys over at inboundli have been super responsive, to any questions I've had with an immediate solution. 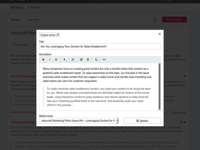 Comments: We're a Hubspot partner and use Inboundli to curate content for our clients. Inboundli makes it easy for us to find great content to share and blog about. The Chrome app makes it easy to save content we find and share it later. The Inboundi Team has been awesome to work with and offered excellent training and onboarding. 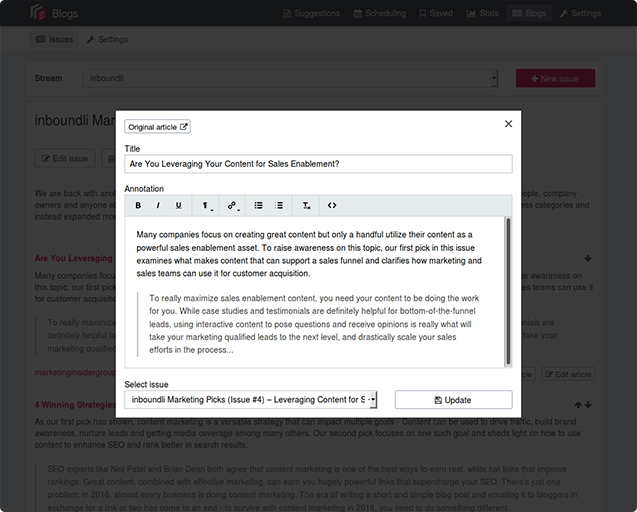 For our clients that curate their own content we highly recommend Inboundli as part of their tool set. Awesome tool; affordable, easy to use and great customer service! Comments: I've been using Inboundli from the very beginning. While the tool was very useful from the get-go, the Inboundli team has done a great job in making their application better, more useful and user-friendly over time. This application will save you time and money and you'll be able to share the most relevant content your target audience is looking for in a heart beat. Two thumbs up! Comments: Gene is great about keeping us updated on our account. The most value he adds is our telephone conversation in which he updates us on social platforms' new algorithms and best practices. He is very knowledgeable and I love that he is friendly and always willing to help. That goes a very long way. Pros: In just a few minutes a day, inboundli helps me to share the best design-related content and engage my target audience. Cons: I'm using inboundli for almost a year and still discovering great use cases for the software. It could use more tutorials or documentation so that features are easier to find. 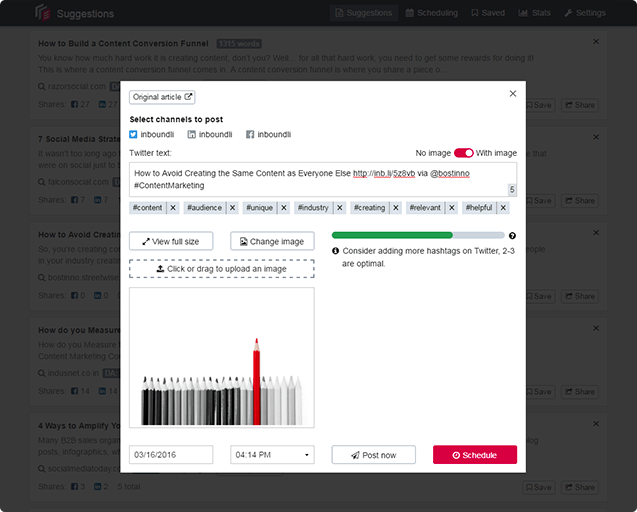 Recommendations to other buyers: If you need a quick workflow to get a lot of high-quality content on your social media or blog, inboundli is not going to disappoint. Comments: I love inboundli because it's easy to use and provides content I'm interested in and my audience engages with as well. As I share the content, it raises my profile as a subject matter expert and increases my following. Comments: Inbound.li enables me to curate and share content that engages our core audience. It's easy to use and I can generally set up multiple days of content in minutes per day. Comments: Inboundli is an excellent tool which saves you hours of research of content. Have been using it for more than 1 year now and I'm extremely happy with it, 100% recommended! Comments: Inboundli is easy to use and saves me hours in my week. Any time I have technical queries, the team are very responsive.